"‘A Career In Your Suitcase’ is the perfect primer to inform and inspire spouses moving internationally. Jo Parfitt writes from the experience of someone who successfully created a number of concurrent and consecutive portable careers." "Research has shown why it’s so important to maintain a professional identity when moving around the world. Jo Parfitt has literally written The Book on how to maintain this identity… full of practical advice and sage guidance, written from the heart by someone who’s been there." "With A Career In Your Suitcase, Jo Parfitt is giving much-needed attention to a subject of increasing importance: meaningful occupations for expatriate spouses." "In today’s global economy, an international career can be built anywhere where electricity and a telephone line are available. 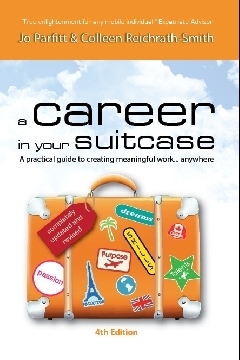 In A Career In Your Suitcase readers will find the practical advice and encouragement to help make it happen." "An awesome networker and intrepid traveller, there is nothing that Jo doesn't know about creating, sustaining and growing a portable career whilst moving round the world. Yes, there really is a career in your suitcase and Jo ensures that you unpack it safely." "Jo is the perfect example of how a ‘trailing spouse’ can make the most of her time abroad. She is a brilliant networker and a great believer in giving out advice and help to anyone she meets who need it. In her book she tells readers how they can use their talents and experience to develop profitable and portable careers. She has certainly practised what she preaches and readers will find her common sense approach to developing a career inspiring and thought provoking." "Jo’s passion and real life knowledge of this subject always mean that her talks are well worth listening to. You even come away learning something if your career is thoroughly stuck in one country, without a suitcase in sight." "I greatly admire your entrepreneurship. A true role model!" "Heard the talk, read the book and seen the website. As an ex-expat myself, it’s all good, helpful, and supportive stuff! Now running my own business, it’s still good to top-up information and make new friends. Thanks Jo." "I attended one of the first Career In Your Suitcase workshops at the Global Living Conference in 1998 and it showed me that I could write a book and get it published, even if I was a Trailing Male and no one else thought I could do it." "Thanks for the wise words – just what the doctor ordered." "Women are encouraged to think outside of the box. Jo Parfitt inspires us to redefine what we need to take out of the box and put into our suitcases. After listening to her portable ideas, travelling light takes on a dare-to-dream ‘blue sky’ perspective. In essence, all you need to carry are the tools you have accumulated within, thereafter it’s all about the re-packaging!" Connie Moser, RMS Relocation Management Services b.v.
"A smart move! The book and complementary website addresses everything and more for spouses on the move. Both informative, practical, personable and supportive, it is a must have tool." "Having watched Jo in action during one of her Career In Your Suitcase workshops, I wistfully wondered why I couldn’t have met her twenty years ago when I first went abroad. Developing my professional life would have gone a lot more smoothly." "If anyone can write about a career in your suitcase, Jo Parfitt can. Her experience, knowledge and network of global contacts are clearly demonstrated in her A Career in Your Suitcase series... true enlightenment for any mobile individual who aims for eternal blue skies." "While both husband and wife have adjustments to make in an international posting, the accompanying spouse (generally the wife) must build a ‘life-between-flights’ so to speak. Those women who have had meaningful careers will gain practical knowledge and skills from Jo Parfitt who has lived the life. Her valuable insights provide excellent coping suggestions." "A Career In Your Suitcase is all about knowing what to pack for that new challenge … Jo Parfitt has become the ‘expert’ when it comes to knowing what to keep and what to leave behind. Insightful, valuable and a much needed tool for anyone relocating. Well done, Jo! I wouldn’t go anywhere without checking with you first!" "I wish A Career In Your Suitcase had been published when I was struggling with the ‘ideal portable career’ while following my husband around the world." "Through her Career In Your Suitcase program, Jo Parfitt helps people everywhere think outside the traditional boxes. She not only teaches but models how each of us can make all the pieces of our lives work together to form something new and satisfying in the middle of a changing world. I recommend this book highly to all who want to learn how to begin seeing the possibilities of new beginnings they may not have recognised before." "o Parfitt has put together an invaluable guide for the ‘career minded’ expatriate spouse. Her books and seminars will give the participants a unique insight on how to enhance their international experience." "Inspiring, practical, and full of activities to clarify, and advice to guide! How wonderful to now have the third edition of A Career In Your Suitcase, an invaluable resource for any non-salaried expatriate spouse seeking to focus her/his own professional direction." "A Career In Your Suitcase should be packed before all other travel essentials! This unique resource provides practical advice for expanding and enhancing your professional credentials while out of country. Jo Parfitt knows how to blend opportunity and creativity into revenue-generating fun for you!" "Jo’s workshops and book provided me with the tools, realisation and independence to operate outside “the conventional box”." "Jo Parfitt’s work has always centred around her concern for expat spouse career issues. She is a thoughtful, well-informed advocate." "At last someone has written a book that addresses the problem in a practical way." "If anyone can write about a career in your suitcase, Jo Parfitt can. Her experience, knowledge and network of global..."